St. Paul’s School for Girls (SPSG) needed a welcoming and interactive workspace that exemplified the idea of fostering “relationships with both people and ideas in a community that feels like home.” These principles are championed by the Head of School, Penny B. Evins, who is instrumental in revolutionizing the educational experience for SPSG. 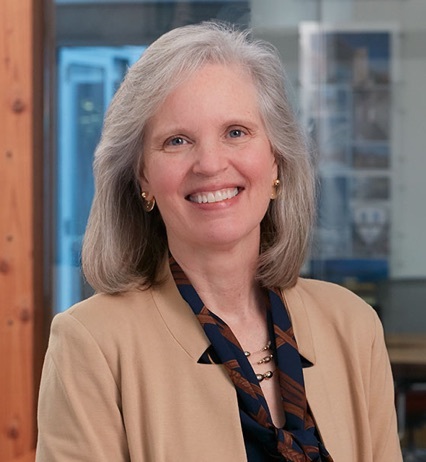 As noted in the Welcome Address on the SPSG website, Penny encourages students to “own their learning and ultimately forge their distinct paths in our changing world. We want our girls to recognize and harness the power of asking questions.” This type of education requires a more dynamic environment than the maze of book stacks and individual study carrels found in traditional library settings. The charge for MCA and Michelle Hooper (an SPSG alum) was to transform SPSG’s outdated 1960’s library into a modern learning commons. The design team and SPSG stakeholders joined forces to create an educational space where people of all ages and disciplines could share ideas. The interior walls and book stacks were removed to create an open, light-filled work area. The communal space is zoned using flexible furniture to cultivate both individual study and academic conversations for group projects. 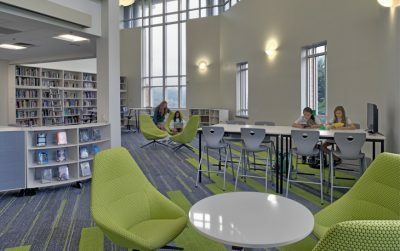 Multiple types of seating are thoughtfully planned throughout the space to support the varied learning styles of SPSG students. Frequently used reference materials and highlighted works are located on low mobile shelves adjacent to the study areas for convenience and display. Taller shelves are placed on the perimeter and become backdrops for the scholarly activities taking place in front of them. These storage strategies enhance the natural flow of people and light throughout the space. The interior finishes compliment the open layout. White and soft greys form a neutral base to reflect the daylight flowing through large windows. These are offset by bright pops of green, which are representative of the school colors. The dynamic linear pattern of the carpet encourages movement throughout the space. The surfaces of the tables double as marker boards to facilitate group discussions or allow students to work through a question. Access to power and data is provided throughout the space to support the integration of technological resources, including shared and personal devices. The end result is an open, bright, and flexible space that serves as the academic hub for the SPSG community. 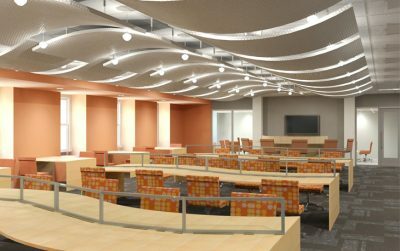 Because of the Head of School’s vision to transform the educational experience, this space was dedicated as the Penny B. Evins Learning Commons. Open communal workspace zoned for individual study and group work. Flexible furniture and multiple seating types support the varied learning styles of SPSG students. 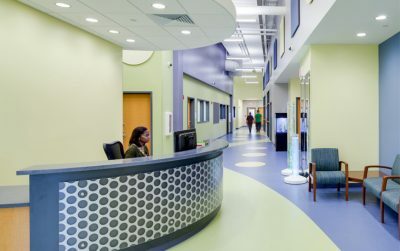 Bright colors and abundant natural daylight create a dynamic learning environment. 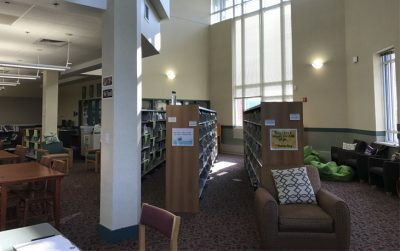 Whether they are working on a group project for their history class, studying for an upcoming quiz with a classmate, or simply looking for resources to help them answer the questions they encounter in their classes, the Penny B. Evins Learning Commons is here to meet those needs. 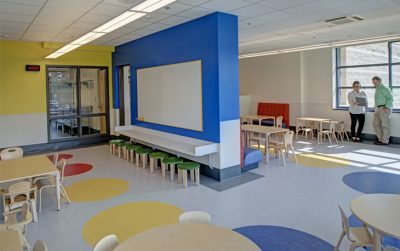 The open layout, natural light, and brighter colors create a welcoming environment that any educator would love to call their workspace.